This album features premiere recordings of pieces by Kaija Saariaho, Joël-François Durand, Bruce Quaglia, and Marc Satterwhite, and includes contemporary masterworks by Donatoni, Sørensen, Husa, and Penderecki. The works on this album were composed between 1980 and 2015, and each presents the listener with complex soundscapes that push the boundaries of clarinet technique. 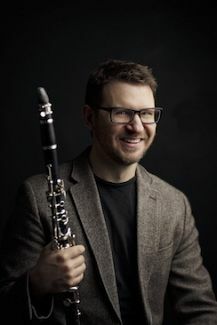 Matthew Nelson is Assistant Professor of Clarinet at the University of Louisville, where he performs with the Louisville Winds woodwind quintet and the Grawemeyer Players contemporary music ensemble. He has performed as guest principal clarinet with the Virginia and Utah Symphonies, and his performances throughout the United States, Europe, and Japan include international competitions and premieres. He maintains an international profile as both performer and pedagogue, with recent engagements as an invited professor on the faculties of the Beyond the Music International Chamber Music Festival and the Curso Internacional “Eduardo Ocón” in Spain. Matthew Nelson is a clarinetist of astounding range and virtuosity, with a tone that is never less than burnished and lovely no matter how spiky and challenging the music he may be playing. And on this album he plays plenty of spiky and challenging music (as well as plenty of humorous and even lyrical music). It’s a collection of late-20th- and early-21st-century works for unaccompanied clarinet, and as you might expect the styles and moods vary widely. Among the highlights are Franco Donatoni’s Clair suite, on which Nelson manages to sound as if he’s playing multiple instruments at once, and Krzysztof Penderecki’s Prelude. For all libraries supporting wind or contemporary-music programs. Wonderfully controlled playing a a real sense of resonance with the contemporary clarinet repertoire are the two major strands that conspire to make this disc an unreserved success. Not for the faint-hearted, perhaps, as a glance at the featured composers will confirm, but there is such rewarding listening on offer here. Written in 2011, Kaija Saariaho’s three movement Duft opens with barely audible low tremolo before exploring a variety of techniques including multiphonics, wide vibrato and microtones. Intrinsically lyrical and described by the composer herself as “intimate” and as an “expressive monolog,” the piece swoops, bends and explores the nature of near-silence fascinatingly. This appears to be the only commercially available recording of the work. The work Le Mesure des Choses (2001) by Joël-François Durand is split into four pieces, of which this, the first, is for solo clarinet (the others are for piano solo, oboe and viola, and percussion; III has been recorded by viola player Paul Silverthorne on Mode 139). The complete set examines in musical terms the four elements, plus time, and it starts with the work presented here, which focuses on air. A work of continual change of basic shapes within time, Durand’s very active work is given a phenomenal performance by Nelson, whose virtuosity seems custom built for this music. The rapid delivery acts, also, as an excellent foil to the lyricism of the Saariaho piece. The other Durand piece, Tiodhlac, takes its name from the Scottish Gaelic word for “gift” and was intended as a tribute to composer James Dillon, celebrating that composer’s fiftieth birthday. The ultra-sensitive playing by Nelson coupled with his extraordinary control of the clarinet’s very uppermost register gives the word a markedly haunting aspect. The name Franco Donatoni will need no introduction to listeners of contemporary music; every time I see his name or hear a composition by him, I am reminded that there is a severe paucity of recordings of his music, not to mention performances in the concert hall or recital room. Dating from 1980, Clair is one of his most popular pieces, with a remarkable three recordings available in addition to this one. The work’s two movements are contrasting, the first bursting with irrepressible, jumping energy, the second far more restrained, returning us to the emotional world of the opening of the Saariaho. The quiet, rapid figuration emerges as beautifully evocative in Nelson’s supremely musical account. Subtitled “Three Vignettes.” Bruce Quaglia’s After Milton is intended as an in memoriam for the great Milton Babbitt; to that end, Quaglia uses material from Babbitt’s My Ends are My Beginnings to create a quiet, profound set of meditations. This is an inventive piece shot through with meaning. According to arkivmusic.com, there is only one other piece by Quaglia in the catalog, a Quartet for flute, clarinet, violin and cello on the Centaur label (a disc entitled New Music from Utah). An Associate Professor of Music Theory at the University of Utah’s School of Music, Quaglia clearly composes systematically: this piece is tightly organized and, although the musical surface is different, there is a sense of Webernian clarity. Again, this appears to be the only recording available of Bent Sørensen’s evocatively titled Songs of the Decaying Garden. Originally titled Impromptu when it first appeared in 1986, the piece was revised in 1992 when John Kruse recorded it (for Paula records, entitled Contemporary Danish Works for Clarinet where it shared disc space with Koppel, Bentzon and Ruders; this disc appears to be no longer available). The Songs of the Decaying Garden concentrates on the process of dissolution, giving three “viewpoints” indicated via the movement indications: Andantino, con delicatezza; Allegretto maniac; Calmo, molto dolce. There is a melting, internal aspect to the work’s final panel that is simply lovely; Nelson’s legato is beyond reproach here. Works by Marc Satterwhite (born 1954) have so far appeared on the Centaur label, so it is good to widen the envelope and find the 2013 piece For Dallas here on Soundset. The work refers to a person, Dallas Tidwell, rather than the place. Tidwell was a clarinetist in the Louisville Orchestra, a Professor of Clarinet at the University of Louisville and was a colleague of Sattershite’s. Tidwell sadly passed in 2015 after a battle with cancer. Satterwhite presents an exploration of the varied emotions of loss couched in a restlessly shifting musical environment. The effect is disturbing, perhaps because it confronts us, ultimately, with our own sense of mortality, of our own lives being of finite duration. A disc of music by Czech-American composer Karel Husa on Albany, which included the powerful Music for Prague 1968, impressed me, and the piece here, Three Studies (2007), is another fine example of Husa’s output. Each movement presents a different trait of clarinet playing: espressivo (“Mountain Bird”), legato (“Poignant Song”) and staccato (“Relentless Machine”). The final movement is especially interesting in its notation, specifying a variety of staccato articulation in combination with specific tone qualities, all performed with admirable confidence by Nelson. Finally, a piece by the most familiar name on the roster of composers here, Krzysztof Penderecki. The short Prelude of 1987 operates like a sonic arch, moving towards a glaring climax high up in the clarinet’s range before returning to the quiet of the opening. Nelson’s minor third tremolos are perfectly judged, as is his tracing of the work’s trajectory overall. Recording quality is of the very top drawer, with the ultra-quiet dynamics just caught perfectly and with just the right amount of space to the sound picture.